​​​​​​​​GEORGETOWN – Park projects are underway in several areas as Georgetown’s population grows. The Georgetown Parks and Recreation Department is working on several projects to ensure residents have spaces to enjoy. After three years of design work, construction on Garey Park began in March. The $13.5 million project should be complete for the park to open April 2018. 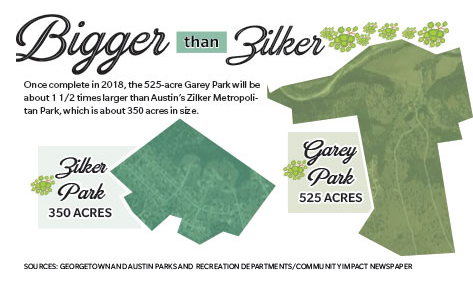 When finished, Garey Park will be about one and a half times larger than Austin’s Zilker Park in terms of size. San Gabriel Park’s first phase of improvements will be completed in early 2018 after two and a half years of construction funded by the 2008 bonds. The first phase includes traffic-calming measures, pavilions, restrooms, parking, a trailhead and entry monuments with signage. The extension will be funded by a $50,000 state grant awarded to the parks department. Construction on improvements at Founder’s Park, at the corner of East Ninth and Church streets, is slated to begin September 2017. The upgrades include sidewalk repairs to make the park more accessible, the installation of picnic tables and a water fountain and new signs to indicate the area is a city park.